Creating custom awards and trophies is both challenging and rewarding. Our designers love to engage in the creative process of transforming client's ideas into crystal. "There is a gratifying feeling of satisfaction when one-of-a-kind masterpieces are accomplished and presented to a client." says Mr. Tolsty our senior designer. 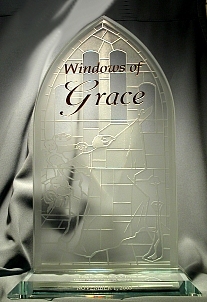 One of our recent custom award projects was "Windows of Grace". A client approached us with an idea of creating a special award for their church volunteers. They wanted the award to incorporate a stained glass design of the windows of the church. The client took detailed photos of the beautiful stained glass windows and submitted them to us. The window drawings were carefully replicated by our graphical artists and then deep etched into a Gothic arch shape. To make the award more triumphant we decided to add a touch of gold by filling in etched letters with gold paint. 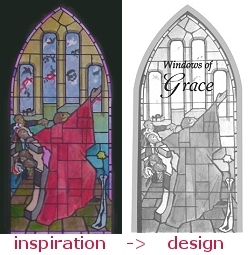 The "Windows of Grace" project was a successful collaboration of creativity, imagination and masterful craftsmanship. Custom projects are initiated in various ways. Sometimes customers have a very definite design in mind and they submit a sketch or a drawing of their project to our designers. Other times, customers describe their project inspirations verbally. Many aspects are taken into account while creating a custom award, like the purpose of the award and mission of the presenting organization. Personal style preference also plays an important role as well as shape and size of the award. Upon assessing the general characteristics of the project, our designers present a graphical proof and written specifications to the client. The production process entails cutting and polishing crystal, deep etching and engraving. When the awards are finished and finally presented to the customer, we receive instant gratification in their satisfaction. There is nothing more rewarding to our crystal artists then knowing how much their art creations are appreciated and treasured.